The x86 platform is the most dominant server architecture today. While the x86 platform was originally designed for personal computers, it is now implemented in all types of systems, from netbooks up to the fastest multi CPU servers. x86 servers are produced by many vendors. Best known vendors are HP, Dell, HDS (Hitachi Data Systems) and Lenovo (the former IBM x86 server business that Lenovo acquired in 2014 ). These vendors typically purchase most server parts (like video graphics cards, power supplies, RAM, and disk drives) from other vendors. This makes x86 server implementations very diverse. So while the x86 architecture is standardized, the implementation of it is highly dependent on the vendor and the components available at a certain moment. x86 servers typically run operating systems not provided by the vendors of the hardware. Most often Microsoft Windows and Linux are used, but x86 systems are also capable of running special purpose operating systems. Most servers in datacenters today are based on the x86 architecture. This x86 architecture (also known as PC architecture) is based on the original IBM PC. The IBM PC’s history is described in more detail in chapter 14. In the 1990s x86 servers first started to appear. They were basically PCs, but were housed in 19” racks without dedicated keyboards and monitors. Over the years, x86 servers became the de-facto standard for servers. Their low cost, the fact that there are many manufacturers and their ability to run familiar operating systems like Microsoft Windows and Linux, made them extremely popular. The x86 architecture consists of several building blocks, integrated in a number of specialized chips. These chips are also known as the x86 chip set. The heart of an x86 based system is a CPU from the x86 family. The CPU contains a large number of connection pins to connect address lines, data lines, clock lines, and additional logic connections. 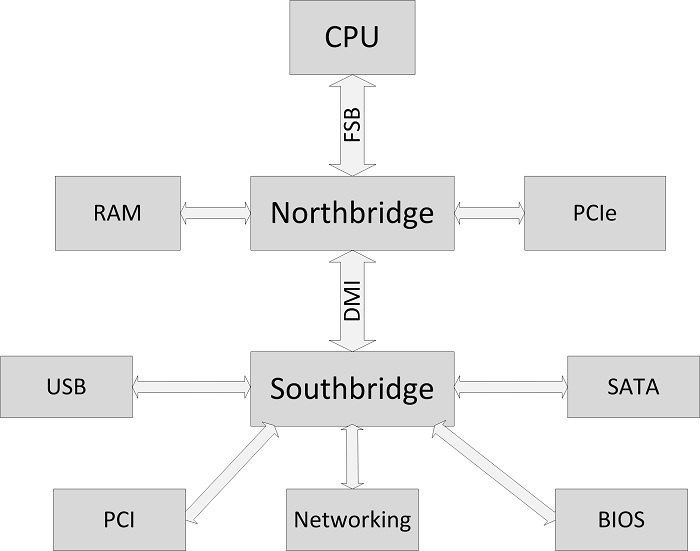 Earlier x86 systems utilized a Northbridge/Southbridge architecture. In this architecture, the data path of the CPU, called the Front Side Bus (FSB), was connected to a fast Northbridge chip, transporting data between the CPU and both the RAM memory and the PCIe bus. The Northbridge was also connected to the Southbridge chip by a bus called the Direct Media Interface (DMI). The relatively slow Southbridge chip connected components with slower data paths, like the BIOS, the SATA adaptors, USB ports, and the PCI bus. In 2008, with the introduction of the Intel 5 Series chipset, the Northbridge/Southbridge architecture was replaced by the Platform Controller Hub (PCH) architecture. 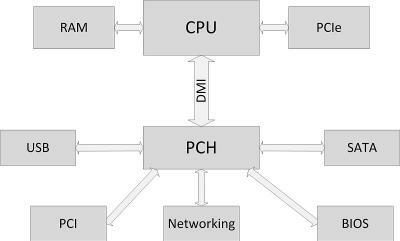 In this architecture, the Southbridge functionality is managed by the PCH chip, which is directly connected to the CPU via the DMI. Most of the Northbridge functions were integrated into the CPU while the PCH took over the remaining functions in addition to the traditional roles of the Southbridge. 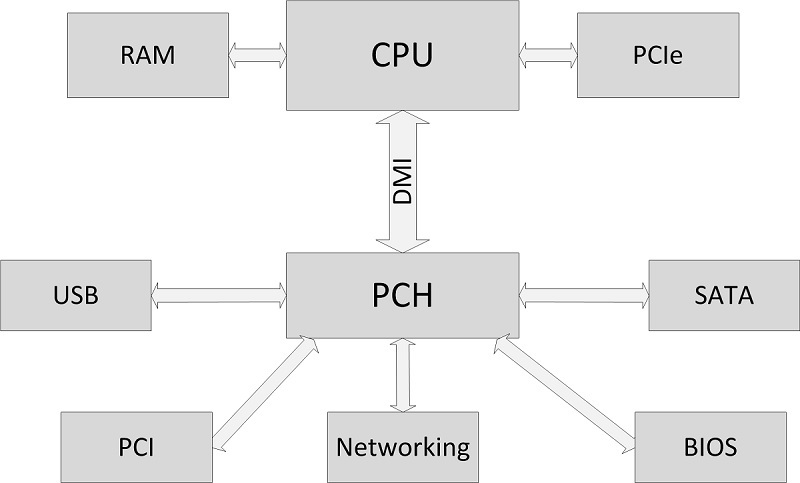 In the PCH architecture, the RAM and PCIe data paths are directly connected to the CPU. Examples of x86 architectures that have the Northbridge integrated in the CPU are Intel’s Sandy Bridge and AMD's Fusion. In 2015, the Skylake architecture is the most recent Intel x86 architecture. Some variants of Skylake will have the PCH integrated in the CPU as well, which makes the CPU effectively a full system on a chip (SoC). In 2015, Intel announced the Broadwell-based Xeon D as its first platform to fully incorporate the PCH in an SoC configuration.